Your surgeon will see you before your operation. Please ask them any questions you have and tell them if you have any concerns about your operation. You can eat and drink as normal before surgery for de Quervain's tenosynovitis. Usually this surgery is done under local anaesthetic (which means you stay awake), but your surgeon will talk to you about this. You may need some extra help after the operation. For example, you won't be able to put full weight on your hand, and so won't be able to use a walking stick or walker with that hand for around two weeks. If you are worried about anything after your operation, contact your GP or the after-hours GP, or use the contact information you were given after your surgery. Your surgeon will check how well your hand is moving, and show you some exercises. They may refer you to a hand therapist for more exercises, and to manage your scar. It is important to gently open and close your fingers, move your wrist from side to side and move your thumb upwards and downwards across your palm after your surgery to help reduce swelling and stiffness. Start this as soon as you have had your surgery. You can use your hand for light tasks such as eating, dressing, or using a computer straight away. It won't do any harm. Light massage and tapping over and about your scar, once the wound has healed, can reduce tenderness, sensitivity and thickening in the scar. To reduce swelling and pain it is important to keep your hand raised (elevated) as much as possible for the first two to five days after surgery. Try to keep the affected hand or hands higher than your heart. It can help to put pillows and blankets under your arm when you go to sleep. Some activities, such as opening jars or gripping objects, might be difficult for two to three days. You will need to avoid firm grasping, pinching and heavy lifting for two to three weeks. 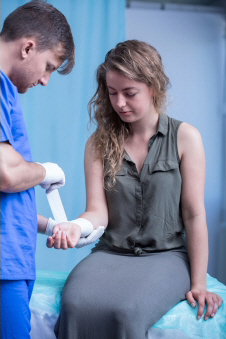 A soft support such as a splint may be useful in the short term. You may be off work for two to four weeks, depending on your job. Some people can go back to work after one week, while can't do heavier work for eight weeks or more.Your surgeon will discuss this with you. Pain will limit what you can do for around six weeks. However, your hand should get better week by week. If you are concerned and not making progress, your surgeon may refer you to a hand therapist.